The book is now SOLD OUT and out of print. There is still a very good chance of locating copies by searching the internet. 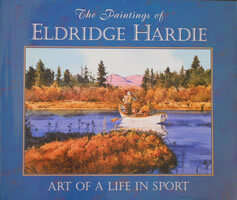 The Paintings of Eldridge Hardie – Art of a Life in Sport, published by Stackpole Books, was released fall 2002. The book with a foreword by Nick Lyons and an introductory biography by George Reiger celebrates the artist's four decades as one of the country's best-known sporting artists. The text departs from the usual verbalizing about the content and composition of the pictures and asks each viewer to bring his own memories and meanings to the images. Instead, it consists of experiences gleaned primarily from five decades of the artist's own hunting and fishing logs. While these notations relate to the general subjects of the paintings, they are not specifically about them, but are intended to compliment the pictures by touching a different chord. There is a special section of the book devoted to the creative process – where original paintings are paired with the preliminary studies and notes leading to the finished piece. Hardie paints the way fisherman and hunters see, with a well-drawn realism that's soft and impressionistic at the edge but hard and clear at the center where the action is...This excellent album of paintings is proof enough that Eldridge Hardie is as good as any painter alive in depicting not only the beauty of nature but also the subtle psychological tug in any fishing or hunting scene… Eldridge Hardie gets it, and he has put it on canvas... for all to enjoy in a truly important body of work. He is one of the finest sporting artists working in America today – to be precise one of the finest artists, period, whose work happens to deal with bird hunting, fishing and the places where sport is conducted. As one might expect, The Paintings of Eldridge Hardie – Art of a Life in Sport from Stackpole Books, is one of the oversize variety that takes up residence on prominently positioned tables rather than languishing on a bookshelf. It stands as a collector's item. That Eldridge Hardie is one of the nation's most admired sporting artists is as much a testament to his passion for outdoor pursuits as his skill with a brush. Like a well-worn Duxback coat or a tried and true double-barrel that has become an extension of your physical being, Hardie's paintings captivate and fill one with a sense of comfort. He is one of our finest contemporary [sporting] artists, and this book is a grand testament to his abilities. …of all the sporting artists working today none has a greater gift for evoking the essence and emotion of an outdoor scene…The folks at Stackpole Books deserve a round of applause for producing such a handsome volume. Even if it blows your whole book-buying budget, this is one you simply won't want to miss. ...Stylish scenes of bird hunting and fly fishing executed with such heart and quality that they seem destined for long term greatness… Under the brushes of lesser artists such moments tend to glare with cliche. Not with Hardie, whose personal light, experience, and technical abilities perform a sort of wizardry in which the composition seems to emerge from our own memory, so real we feel the mud on our boots. This unique book contains his stunning oil and watercolor paintings reflective as the title says of his life in sport. Eldridge says in the preface, “I was born to paint, hunt, and fish.” And the sporting art world is all the better for it. Page by page The Paintings of Eldridge Hardie – Art of a Life in Sport encouraged me to sit quiet. Often, I found myself adding sense memories to the visual images...100 years from now fishermen and hunters will appreciate his paintings as much as many of us do today. A splendid look at the work of one of the preeminent outdoor artists in the world today...plenty of memories in this book...a keeper. Not only have Eldridge Hardie's paintings illustrated the pages of Ducks Unlimited and other prominent outdoor magazines, his limited edition prints have been prized auction items at countless DU events across the nation...His work is now collected in a beautiful coffee table book.